You recently completed a great on-site interview for a new physician practice opportunity. Everything went smoothly, you have an exciting offer in hand, and the opportunity seems to be a fit. However, maybe you're not 100% sure if you should leave your current practice. Also, you may even have another offer or two to consider. How do you decide which opportunity to accept, if any? 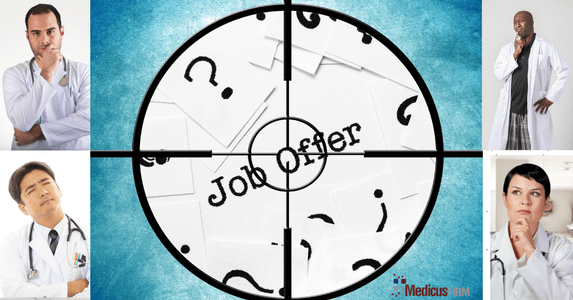 Here are a few pointers, from the TMF recruiting team, for making a decision about a physician job offer. Review your initial motivations – Especially if you are leaving another practice for this new opportunity, you need to be sure that your initial motivations are being met. Does the new offer address the concerns you have about your current opportunity? Whether you are seeking better pay, better hours, or a different practice structure or patient mix? Consider the long-term as well as the short-term benefits – Any time you accept an offer, even if it is the best opportunity, there is usually short-term discomfort involved, such as closing down your current practice and/or working out a notice, packing up the house, relocating the family. However, consider the long-term gains. Will you be able to retire earlier, or retire richer? Will you have more time to spend with loved ones? In order to truly envision the long term benefits, consider where you will be 10,15, or 20 years from now, if you were to accept this job. Do you think you would you would more likely regret taking this opportunity, or would you regret NOT taking it? Don’t rely too heavily on outsiders’ opinions – You have to do what is right for you, your family, and your career. Only you know what is best for you, and maybe one or two trusted advisers or family members. You know what they say about opinions – everybody has one! Each opinion is different, and many of them have nothing to do with your decision. Each person’s unique personal circumstances influence their personal perspective, which will just add more confusion to your decision. In fact, often it’s best not to discuss your options with acquaintances outside of your family unit, until after you’ve made your decision. Friends and acquaintances will always be supportive of a decision you've already made. When all else fails, make a list – It may sound cliché, but making a list of the “pros” and the “cons” of the decision can really help you see clearly the choice you need to make. This helps provide a visual aide for all the factors involved in the decision - you will plainly see one column fill up with many more items than the other. If the columns are close, consider the value or impact of each item on your list and rank which ones are most important. Whichever column has the most high-impact factors on it is likely the way you should go. Set a Deadline – Once you have a written offer and contract in hand, the clock is ticking. The longer you take to make a decision, the least interested you appear, and the potential employer may start to lose faith in your interest in their opportunity. This critical time period can breed mistrust if allowed to continue for an extended period of time. Nothing is going to change about the opportunity, the community, or the contract, between now and your deadline. Therefore, you need to think things through as soon as possible, based on the facts you have gathered throughout the interview process, and come to a conclusion. Even if you are waiting on clarification of minor details, decide in your mind if you would accept once those details are explained to your satisfaction. If the answer is “yes”, go ahead and let your potential employer (or the recruiter) know (preferably in writing, or by signing the contract with the item initialed for clarification) that you accept the offer contingent on that particular detail. A bonus benefit of doing this is that you’re more likely to get what you’re asking for (if you are requesting a concession or change in the contract) if you sign the contract contingent on that item. It shows that you are serious about the opportunity and not just trying to buy time to interview at other locations.